If you enjoy the warmth that natural light offers but prefer your windows to have a finished look, sheer shades may be the perfect choice of window treatment for you. 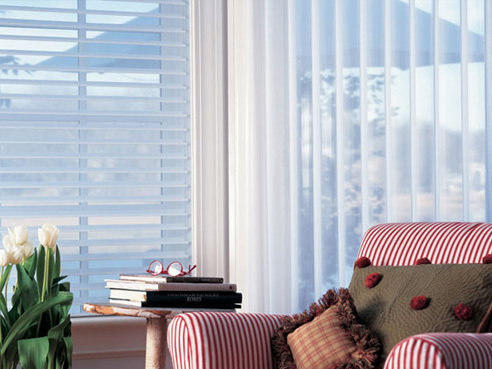 This versatile window treatment provides light control, yet is sheer enough to allow a view of the beautiful outdoors. Sheer shades will give your window the soft look you want while efficiently controlling sunlight, much like soft shades. Whether your goal is to brighten a room or make it cozier, sheer shades accomplish both tasks. Consisting of vanes or louvers that are suspended between fabric facings, sheer shades maintain a soft look, open or closed.